Eventually, the usage of reusable straws became a movement. It all began with one heart-wrenching video of a sea turtle with a plastic straw stuck up its nose. According to a Phys.org article, there are about 437 million to 8.3 billion plastic straws on the world’s coastlines, 7.5 million of them from the US alone. As large as that number is, plastic straws only make up a mere 2,000 tons of the 9 million tons of total plastic waste that pollutes oceans annually. As incredible as it is that humans are finally acting upon an environmental concern, we can’t deny that there are billions of videos and photographs similar to that of the sea turtle. A HuffPost article from 2017 includes sickening photos of animals harmed by plastic—a shark caught in a plastic bag, a bird with plastic debris in its stomach. It’s just one of many articles that have highlighted examples of plastic waste causing injuries and fatalities of innocent sea creatures. This problem is clearly a result of all plastic waste, but why have we recently become so consumed with specifically cutting out straws? The easy response is that for able-bodied people, plastic straws are items without which we can survive. For most of us, they don’t require a huge behavioral shift to cut out, especially when one can instead carry around a trendy, reusable straw. Able-bodied individuals don’t necessarily need straws. Whether they are plastic or reusable, they’re merely instruments that hardly affect the drinking process. The same cannot be said for many other plastic items. Plastic bags, cups, lids, toothbrushes, shampoo and conditioner bottles, and others are so finely integrated into our culture that banning these items would require a tougher habit change. It’s like cutting down forests to build new developments. We know it’s terrible for the environment and only going to end up harming our health in the future, yet we do it anyway because finding a more sustainable option is time-consuming and too much work. In recent months, there has been heightened debate regarding plastic straws. Similarly to a Twilight Team Edward versus Team Jacob phenomenon, the straw saga has developed two opposing teams. There’s Team Pro-Ban: the people who strongly believe in the wastefulness surrounding plastic straws and are down for the ban. The people who make up Team Anti-Ban are two fold: those who believe the focus on straws is pigeonholing society in sight of a larger environmental issue, and those who believe the ban excludes those who need straws due to disabilities. As with many politicized debates, it’s impossible to pick the “right” side as so much of what people argue is based on personal opinions and values. In my humble opinion, the straw saga has brought to life a terrifying issue: the idea of perceived “greenness.” This issue was in existence long before the plastic straw ban but has become particularly prevalent today. I once heard a student sarcastically mutter that a friend “forgets to turn off the lights in her dorm and takes hour-long showers, but she uses a metal straw, so she’s ‘green.’” Unfortunately, I couldn’t agree more. This is in no way an attempt to attack those who use reusable straws. In fact, I applaud it. It’s undeniable that cutting down plastic—no matter how much or little—makes an impact. Where the issue lies, however, is in the belief that one’s work is done by using a reusable straw when, in reality, that should be just the beginning. Banning some sort of plastic waste is a step in the right direction, albeit a small one. And many companies have decided to do just that. According to a Mashable article, Starbucks announced in July that it was going to start phasing out plastic straws by 2020. It has already started replacing the straws with plastic sippy-cup-style lids. 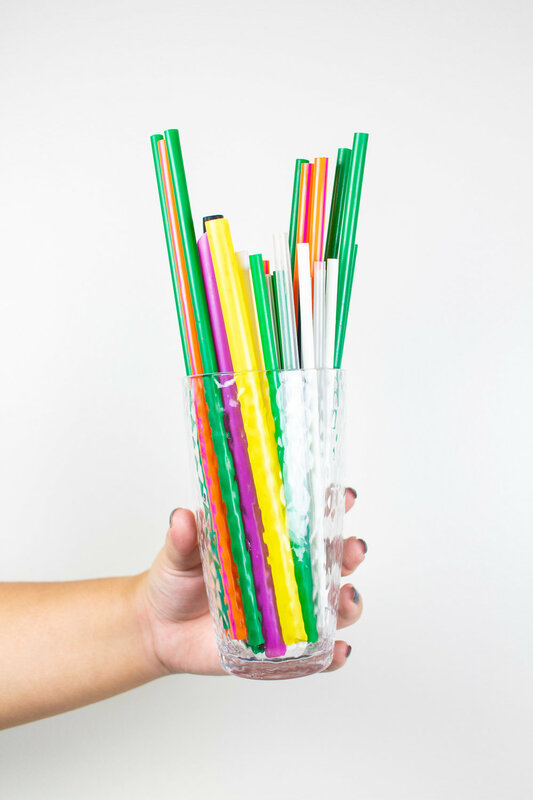 In addition to corporate bans, entire cities, such as Seattle, Miami Beach, Oakland, and Malibu, have pledged to ban plastic straws altogether. While it’s great that many are taking these steps, I can’t help but wonder if these cities and companies have thought about Team Anti-Ban. To use Starbucks as an example, their plastic straw ban is great, but how effective is replacing plastic straws with plastic sippy-cup lids? Starbucks hopes that the lids will be recycled more frequently than the straws were, given their larger size and ease of sorting during single-stream recycling, according to Forbes. However, it’s difficult to say whether or not customers will act upon this change. Regardless, the lids are still plastic. In addition, by banning plastic straws, these companies and cities ostracize customers with disabilities. According to an NPR piece, paper and biodegradable straws disintegrate quickly and can be bitten through by people with limited jaw control. Silicone straws pose issues for people with mobility challenges since they are inflexible. Metal straws can conduct heat which creates safety risks. Reusable straws in general need to be hand-washed, which isn’t always possible for people with certain disabilities. Overall, some people actually need those plastic straws. A great way for companies to support the cause while still supporting people with disabilities is by providing plastic straws only when requested. The hope is that most able-bodied individuals will get the message and bring their own straw or sip their beverage straw-free. Then, the individuals who require a plastic straw will have access to one. The moral of the story is that there is no right answer. Eliminating plastic straws is a step towards saving the environment, but also a step towards further victimization of people with disabilities. It is better than nothing but allows people to believe that they are saving the environment when there’s still plenty of work to be done. It’s up to us, as consumers, to continue demanding more from the companies we support while also making sure we’re doing more than just the bare minimum. In the meantime, the saga continues….